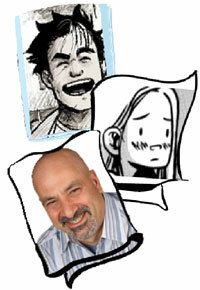 Deconstructing Comics #583: CAT 2017, and Bryan Lee O’Malley! Tim attended CAT 2017 on November 25, with job one being a talk with Scott Pilgrim and Seconds creator Bryan Lee O’Malley! O’Malley answers some lingering questions from those books, and discusses the inconsistent censoring of cursing in Snotgirl, giving characters body language, why autobio comics are so popular, and what, if anything, he would change about his published work. Tim also talked with a couple of other creators (many of the denizens of Artist’s Alley were the same ones we met at Kaigai Manga Festa in the past two episodes) and covered a workshop on Risograph Printing presented by Natalie Andrewson, Ryan Cecil Smith, and Grame McNee. Also in this episode, we’ll hear from CAT co-organizer Adam Pasion about how this year’s event went, and lessons learned for next year. Comic News Insider Episode 701 – No Sleep til SDCC! Comic News Insider: Episode 700 is now available for free download! Click on the link or get it through iTunes! Sponsored by Dynamic Forces. No rest for the podcaster! The epic 700th episode went down last week and now it’s off to San Diego for Comic Con! Because of all the mad planning and prepping, Jimmy does a quickie solo episode to let you know what his media coverage/plans are for this year’s SDCC. He recruits some friends to do some mp3 reviews for him so it’s not entirely all Jimmy all the time. You’re welcome! Thanks to Rich, Emily, Monica and John for sending their audio reviews in. News includes: a new Jessica Jones comic is coming from Brian Michael Bendis and Michael Gaydos, DC/Vertigo is bringing a comic book sequel to the 1987 film The Lost Boys, Betty Boop returns to comic books via Dynamite Entertainment, Dark Horse announces more adult coloring books including Star Trek and Buffy the Vampire Slayer, and Bryan Lee O’Malley has a new graphic novel trilogy coming your way. Jimmy will do an SDCC recap next week and will probably just release SDCC specials for 2-3 weeks to catch up on life. So, no regular format podcast for at a bit. Hope you enjoy all the massive coverage he’s going to get! And if you see him out there, say “hi”! On this week’s episode, the Two Guys with PhDs discuss three very different recent titles. They begin with the comics adaptation of Albert Camus’s The Stranger, written and illustrated by Jacques Ferrandez (Pegasus Books). Originally published in French 2013 — and translated by Sandra Smith — this is a graphic retelling of the absurdist classic. What is most notable about their discussion is that the guys are coming at this book from different perspectives of awareness. Derek knows the work of Camus very well, while Gene had never read the original novella. This leads them to slightly different interpretations of the story events as revealed through Meursault’s narration. And the guys’ experiential differences also come through in their readings of the text’s absurdist theme. Next, Gene and Derek look at Bryan Lee O’Malley and Leslie Hung’s Snotgirl #1 (Image Comics). This is O’Malley’s first monthly series, and the guys were expecting a lot from this title. While both appreciate Hung’s art, they’re not entirely sure what to make of the story…at least, yet. At times it seems as if O’Malley is trying too hard to capture a particularly younger voice. 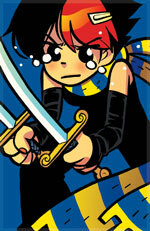 And this is strange, coming from the creator of the Scott Pilgrim series. For example, both Derek and Gene are unsure of the story’s emphasis on the “hipness” of blogging. On the one hand this premise seems passé, but on the other hand the guys wonder if O’Malley is just establishing a tone that he will critique in subsequent issues. Ultimately, while the guys are intrigued by this inaugural issue, they’re nonetheless going to adopt a “wait and see” attitude and discover how the story unfolds. The final segment of the episode is devoted to the latest issue of Frontier, the quarterly monograph series of new talent from Youth in Decline. Kelly Kwang is the artist of the most recent release, #12, a non-linear narrative surrounding a game called Space Youth Cadets. This isn’t so much of a story as it is an exploration of the contexts surrounding such a game: what powers certain characters have, their storyworld, their clothing and accoutrements, and the designs that would distinguish the game in the public eye. Kwang’s black-and-white art is both intricate and intimate, revealing a closeness with technology and social networking. Derek and Gene also say a few words about Frontier #6, Emily Carroll’s issue that has just recently come back into print, and about the Frontier series as a whole. Years ago, when the Scott Pilgrim series was only half-finished, Tim and Brandon discussed it on this show. Since the series was completed, we’ve discussed Bryan Lee O’Malley’s other books (Lost at Sea and Seconds), causing Tim to reconsider Pilgrim, what O’Malley did right (and wrong) in the series, and what it all means. This week, Tim and Kumar take on the whole six-volume series. Was it really necessary for Ramona to have so many exes? Did Scott end up with the right girl? These questions and more! Deconstructing Comics #424: Nathan Fairbairn’s coloring; we ask for “Seconds”! While some colorists’ work can be recognized no matter what kind of story it is, Nathan Fairbairn says he prefers to start from scratch in his approach to each story he colors. While his colors on Bryan Lee O’Malley’s work tends to be bright (and often influenced by O’Malley’s own vision– such as the colors of Knives Chau’s scarf), his other work may be much more subdued. Tim talks with him this week about how the style of comics coloring can affect how quickly or slowly people read the story, what can go wrong with colors and the printing stage, the history of comics coloring, and more. You know that feeling when you love an artist’s work, but then you get their next one, and feel like… ehh, the magic’s gone? Tim was afraid that would be his reaction to Bryan Lee O’Malley’s Seconds but, as he discusses with Cassey this week, his fears were completely misplaced! Also this week, a discussion with Kenneth Kit Lamug. His picture book A Box Story won a Moonbeam Children’s Book Award, Pinnacle Book Achievement Award, a Children’s Literary Classics Seal of Approval, and was a National Indie Excellence Book Award finalist, all in 2012. Now trying his hand at comics, he recently funded a Kickstarter project for The Tall Tales of Talbot Toluca: Quest for the Ore Crystals. Tim talks with him about the Kickstarter, moving from illustration to comics, not quitting his day job, and more. Joining Tim and Jake is one of those female comics creators the mainstream isn’t hiring, EK Weaver, creator of the Web comic The Less than Epic Adventures of TJ and Amal (that’s Amal in the top picture at left). We discuss why women are so much further out of the comics mainstream in the US than they are in, oh say, Japan. 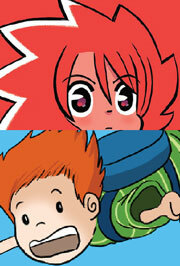 Also this week, Tim’s former day-job office mate Cassey, now based in Anchorage, joins Tim to discuss Bryan Lee O’Malley’s pre-Scott Pilgrim work Lost at Sea, the coming-of-age story of 18-year-old Raleigh (middle picture). Comic News Insider: Episode 349 – More SDCC w/ Jason Momoa (Conan), Saul Rubinek (Warehouse 13), Candace Bailey/Kevin Pereira (Attack of the Show), Joyce Brabner & Elfquest cast! Comic News Insider: Episode 349 is now available for free download! Click on the link or get it through iTunes! Sponsored by Dynamic Forces. More San Diego Comic-Con madness! Jimmy flies solo so he can get all of the great coverage out to you as quickly as possible! He gets in a question at the Jason Momoa (Conan, Game of Thrones) press conference and sits down with Saul Rubinek (Warehouse 13), Candace Bailey/Kevin Pereira (Attack of the Show), Elfquest cast and Joyce Brabner. News highlights include: Frank Darabont steps down as showrunner of The Walking Dead, images of Batman/Bane fight from Dark Knight Rises, Warner Bros. pushes back Man of Steel release date, Bryan Lee O’Malley’s new comic, DC wants to hire more women, George Lucas loses Stormtrooper rights in UK, court rules in favor of Marvel against Kirby, IDW will publish Star Trek/Legion of Superheroes mash up, Marvel will publish “Season 1” comics, Vertigo to publish Fables spinoff, Brian K. Vaughan returns to comics, and Tony Lee & Becky Cloonan will bring you a Macgyver comic! As always, Listener Feedback, the Top 3 and more! Leave your iTunes comments! 5 stars and nothing but love! 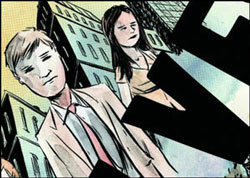 With a main character who “revolves” between a mundane world where he has a lousy job, and an alternate world where multiple terrorist attacks have thrown the average person into a bleak, violent survival mode, Revolver (by past guest Matt Kindt) explores issues from nature vs. nurture to violence in video games. Tim and Brandon review. In this special episode, I talk about one of the greatest comic series of our generation, Scott Pilgrim (ONI Press) by Bryan Lee O’Malley. 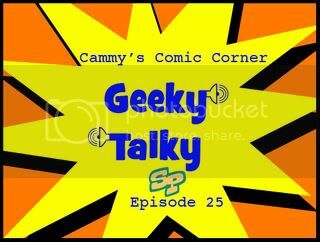 Tune in to Geeky Talky Episode 25 for a very in-depth spoiler-filled discussion of the series, movie, video game & soundtrack! In this episode, I’m joined by Nic Fury, Haley Manbat & Jeremy Awesome as we all discuss Scott Pilgrim (Oni Press) by Bryan Lee O’Malley! We talk about books 1-6, as well as the movie. Spoilers apleanty! FLASHBACK! 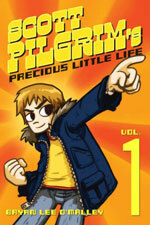 With the Scott Pilgrim movie coming soon, we re-present Tim and Brandon’s review of two Canadian coming-of-age comics: “Scott Pilgrim’s Precious Little Life” by Bryan Lee O’Malley, and “Paul Has a Summer Job” by Michel Rabagliati (originally presented June 2, 2008)! 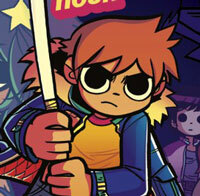 After almost 10 years the Scott Pilgrim series by Bryan Lee O’Malley finally comes to a conclusion. This week the Dollar Bin puts together a group comprised of those who have been waiting for years to those have been waiting hours to finally discover Scott Pilgrim’s Finest Hour. Let’s see what they had to say.